This map explains the movements of the French, British, and Prussian forces from the 15 to the 18 June, 1815. Napoleon seized the initiative in the Hundred Days campaign by marching his army across the frontier and into Belgium on 15 June. He struck Blücher’s Prussians with his main force at Ligny on 16 June, but his victory was less than decisive. Marshal Ney was held at bay by Wellington during a hard-fought battle at Quatre Bras on the same day, but the Anglo-Dutch army was forced to retreat that night due to the Prussian defeat. 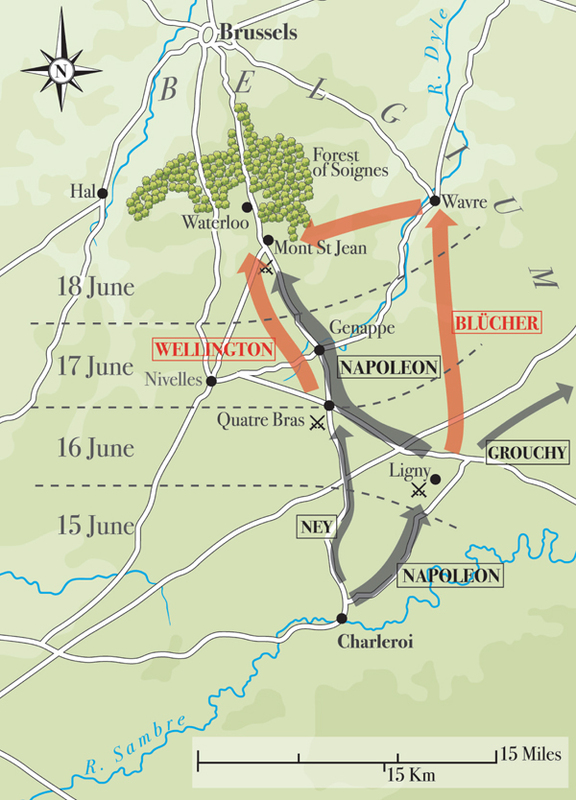 Both armies were on the move during 17 June – towards Waterloo. The full article can be found in the May issue of Military History Monthly, on sale 13 April 2012.